A speculation which probably goes way off the mark: the difference in 'peak', perhaps, is a result of the differences in academic cultures? I imagine the scientific community will put more emphasis on the 'new' and 'innovative', which is not so for humanities (in general). I am wondering if there is any comparison between philosophers of Mind, Language, Cognitive Science vs. Ethicists, Social & Political Philosophy, etc. And, also, the 'need' for literature review in scientific disciplines and humanities/social sciences seems to be different too. In any case, the author cites a study (I forget whose, maybe even the same one you cite) that suggests that mathematicians and scientists are peaking later as time goes on. One explanation of this, as I recall, was that nowadays there's a much larger body of knowledge that needs to be assimilated before one can start making an original contribution. Thanks for the thoughts, Anon & GP! Anon: I haven't compared by subfield. I would need a lot more data for meaningful comparisons along those lines. But I think you are right that part of the explanation might have to do with academic subculture differences -- whether those particular variables are the relevant ones, I'm not sure. GP: Thanks for the tip. The hypothesis you suggest is an interesting one -- though I'm not sure I see that trend in philosophy. Some of the oldest "peak" producers in philosophy were pre-20th-century (Reid, Leibniz, and Hobbes). I have a hunch that there is a longer 'bringing to market' time in philosophy than in physics. I.e. the time between getting an idea and having a publishable version is relatively long. I know that Kuhn claimed to have his central insight as a student, but it took a while to turn it into the eventual book. This might explain a small part of the gap, but it would be hard to get real data on it. 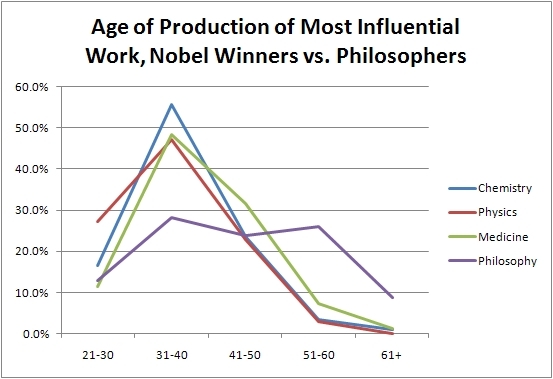 Eric, are you saying that the mean age of the philosophers from your previous post (44 years) corresponds to the "age of production" for philosophers on the chart in this post? Looks like it does. Thank you. JP: I suspect you're right. One complication, though, is that in philosophy so much turns on the details of expression and argument. Merely having an idea is one thing; working it into a beautiful piece of philosophy is another. Nobels are not a good proxy because they are given at a considerable lag after the discovery (20-30 years) and as the Nobels are given only to living people it puts people in their 60's over the range of life expectancy. If someone makes a discovery in their sixties is unlikely that they will live long enough to win the Nobel. Good point. But even the 50s is very low. 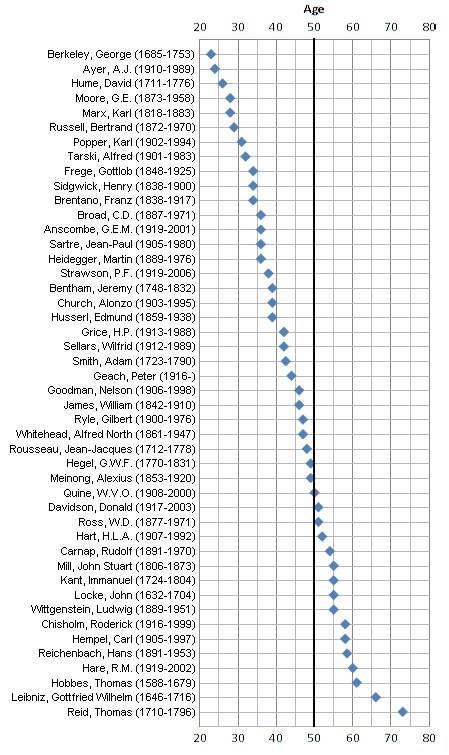 I’m curious now about cases of plausible Nobel winners who did the groundbreaking work 55+ but died too early. Especially plausible if younger collaborators did win, cf Rosalind Franklin (though she wasn’t old).